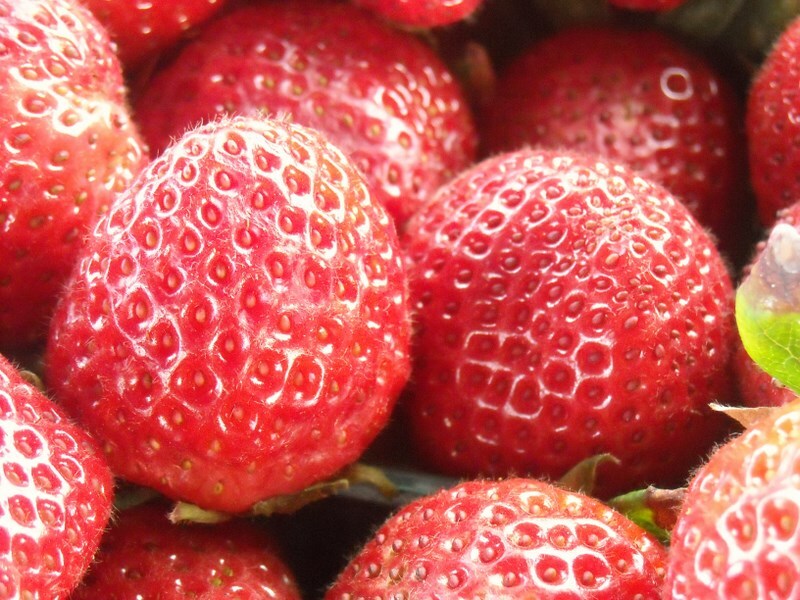 My article for these delicious guys is up on Patch, so click that link and check out all the goodies on strawberries. 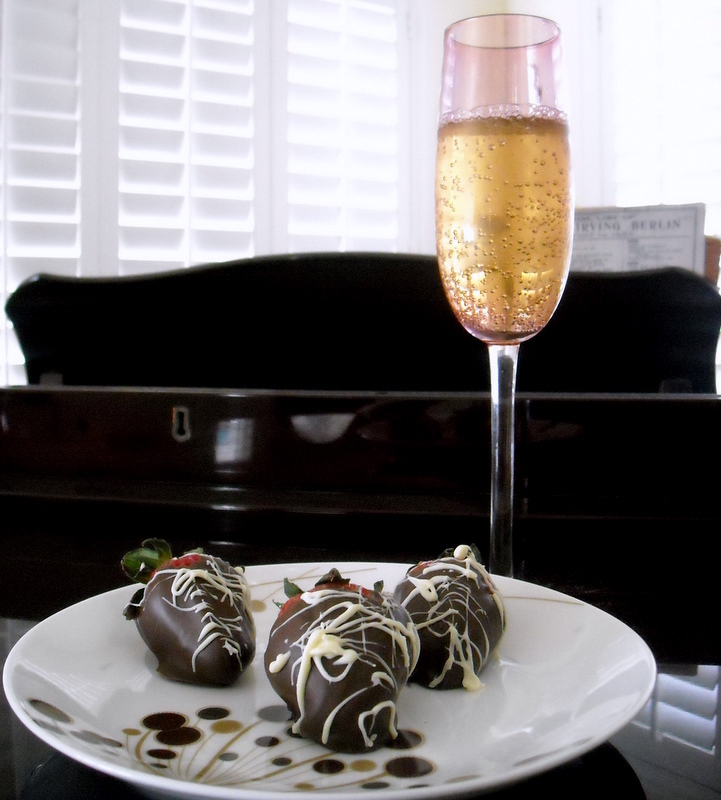 And because most of you won’t click that link, here’s the recipe for my Drunken Chocolate-Dipped Strawberries. If you didn’t guess from my teaser of these Valentine’s Day treats, I injected the berries with Triple Sec for a burst of orange flavor as you eat the berry. WARNING: These chocolate-covered strawberries are best eaten whole, so as to save you the trouble of dribbling delicious orange liqueur down your lip. Because that’s just wasteful. Here’s the recipe, enjoy the pics! Thoroughly wash and dry your strawberries. Let them sit out, after washing, on a pan covered in wax paper for about an hour before dipping. You want absolutely no water anywhere near the chocolate. Fill up your food injector with the orange liqueur. 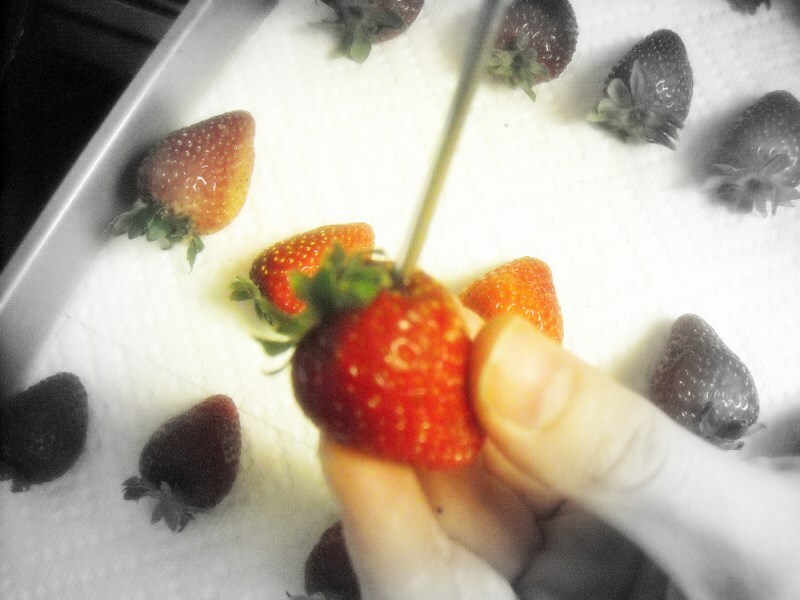 Pierce each strawberry with the injector near the top of the strawberry and fill with alcohol. Only a very small amount will fill up each strawberry. Melt the milk chocolate chips in a microwavable bowl for about one minute on half-power. If they glisten, as if they’re wet, take them out and stir, stir, stir. Keep stirring until creamy and smooth. If they’re not yet glistening, put them back in the microwave for another 30 seconds at half-power. 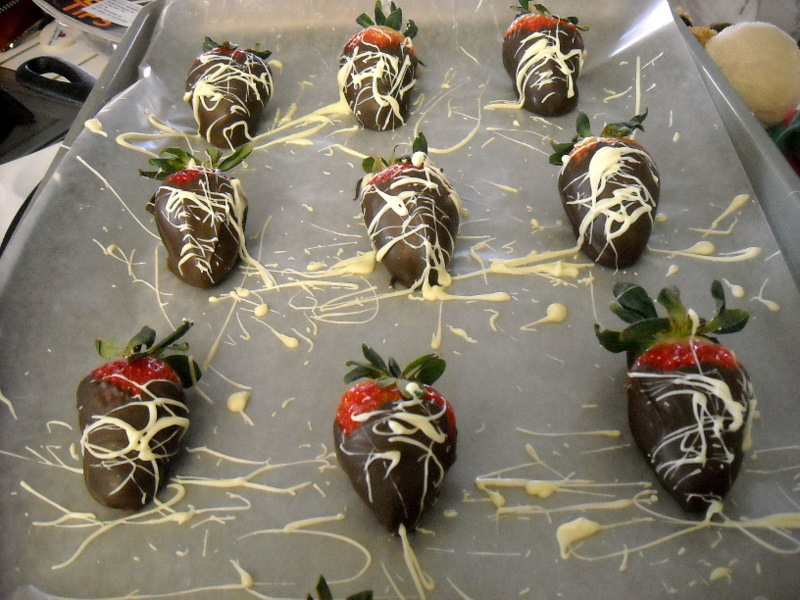 Holding the strawberry by its stem, dip the strawberry in the melted milk chocolate, side to side, then front to back. Put back on the wax paper and repeat with remaining strawberries. 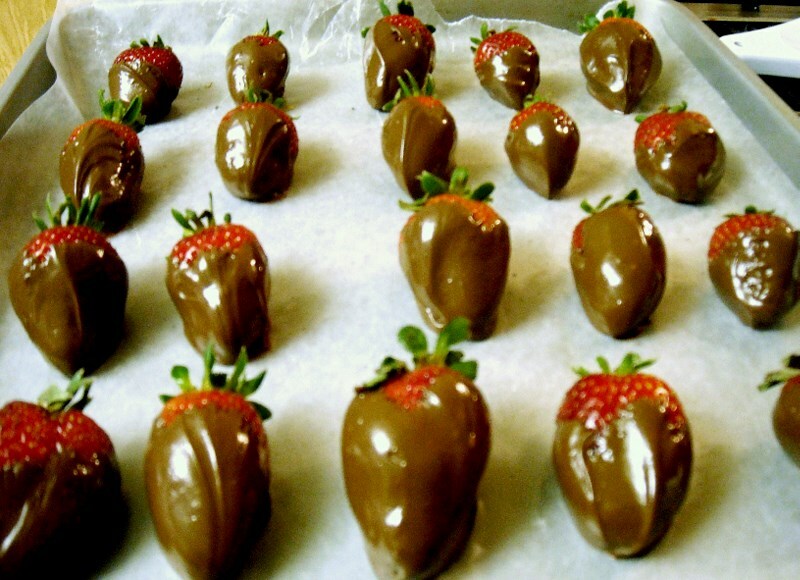 Once all the strawberries have been dipped in the milk chocolate, put them into the fridge to set the chocolate. Leave them in there for about an hour, or until the chocolate has hardened. Melt the white chocolate chips the same way you melted the milk. 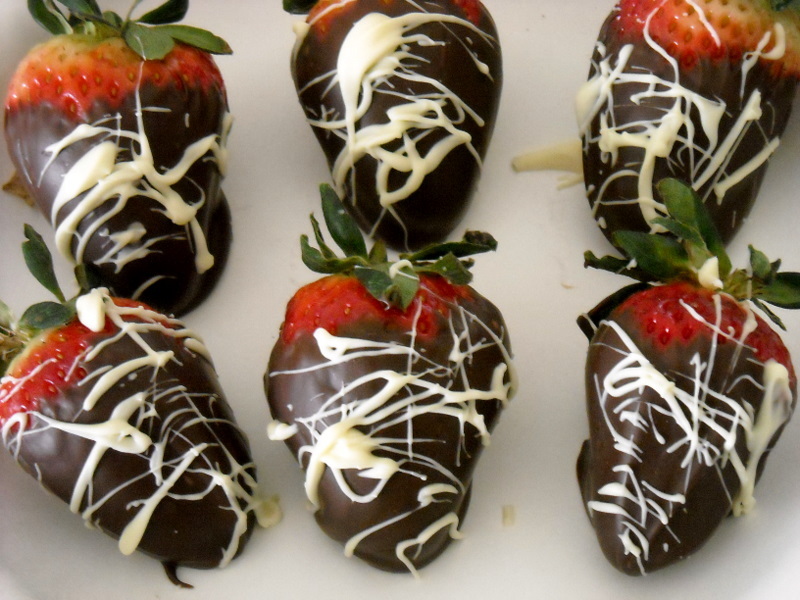 Dip a fork into the white chocolate and drizzles over the hardened milk-chocolate dipped strawberries. You can store these in your fridge in a plastic container for about two days. I don’t know if I ever told you I made these last Valentine’s day. I used Chambord raspberry liqueur instead of triple sec and they were gooey, yet yummy! yum! Gooey usually equals yummy anyway. I want to try them with champagne injected into them!